Adrian Lara (Perú, 1987) has been singing for many years, both as a chorister and as soloist. In Perú he studied philosophy and music aesthetics until he came to Norway (2012) and decided to study music.He started singing in the National Children Choir of Peru (CNNP). Since then he has been part of various projects (male choirs, opera choirs, jazz vocal ensembles, etc). 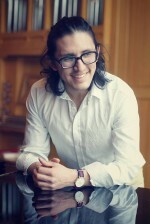 He started his bachelor studies in classical singing as a countertenor at the Norwegian Academy of Music (NMH) where he now studies with Mona Julsrud and Folke Bengtsson, mostly working on the repertoire of the early baroque era. In his project Nousikk he tries to develop the idea of “common musical intuition of life” by combining early and contemporary music in chamber music context with the help of other art forms, like poetry and improvisation. In 2015, together with other students at NMH, he founded the baroque ensemble “Amore Torna”. Since he moved to Norway he has been part of Schola Cantorum, the Oslo Cathedral choir and the Norwegian Youth Choir.